As we watched the market grow, we have always been aware of the need to analyse both structured and unstructured text. We see more and more how companies that do voice-of-the-customer listening, also have a need to listen to their social media domains. While we already have powerful software that gives immense insight into a business, that software does not take the social media world into account. To solve this for our clients, Genex has partnered with IBM Watson to develop a suite of listening tools that analyse sentiment, category and competitor trends in real time and bring it into the VOC context. Genex customers already enjoy a comprehensive view of the sentiment in their business. They can drill right down to actual comments and can report and address any problems in need of resolution. With the planned social media enhancements, our clients will still have one system that can not only analyse both structured and unstructured data, but also integrate with our class-leading Resolve software to process escalations no matter where they come from. In the past social listening was all about sentiment. We don’t believe, however, that sentiment gives the best insight. To enrich the information our customers get, we’re moving away from sentiment (positive, negative or neutral) towards looking at the five basic human emotions. This leverages some of the class-leading developments in IBM’s artificial intelligence stack, Watson. These decisions and developments will soon give our customers the ability to track headline scores in a structured context in their VOC programme. As sentiment scores become more negative or positive, VOC teams will be able to see what the bearing is on the structured feedback scores. We’re continuing with our concept exploration, but with what we’re working on, companies will be able to simply plug their social media profiles into our current live environment, and add those insights to the insights they already have. Currently, on our existing platforms, the VOC team can see right down to comments on a person-level, but it only includes the comments we get from surveys that customers completed. Plugging in the social media component enables you to not only see what your customers say in the survey they complete, but also see what is being said in your closed communities, such as your emails, and across your social channels. 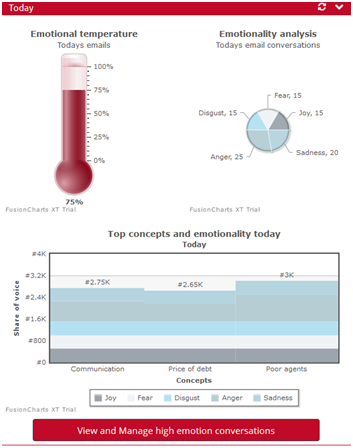 These insights are at their most powerful when they drive action, which is why you can see down to the very comment that sparked the emotionality rating and manage the conversations that show a high degree of emotionality. It’s safe to say that there is immense value in analysing unstructured data. Of course, there is a glaring opportunity when it comes to this type of data: voice. Adding voice to the sources of unstructured data at our disposal will add richness to an organisation’s insights. In true Genex spirit, this is why next, we will add voice.